Trinamool was a change of regimen only on paper; it's run by the lumpen elements that previously manned CPM syndicates. India remains the largest democracy in the world. The US, a much smaller democracy though a more matured one, boasts of development as the platform for competition amongst political pundits craving for a stint at the White House. It has been gratifying, as an Indian staying abroad, that Modi has finally succeeded in bringing development as the prime mantra for political survival. It is sad that while in many parts of India the electorate has blossomed to utilise this mantra to decide their political rulers, my home state of Bengal continues to lag behind. In all fairness, in spite of the wounds of Partition, in the initial years of independent India, West Bengal fared exceptionally well and was recognised as one of the most industrialised states of the country. This period has been exclusively a legacy of Dr Bidhan Chandra Ray, whose vision and mission ensured a vibrant Bengal echoing what Gopal Krishna Gokhale said decades back "what Bengal thinks today, India will think tomorrow". In fact, till the mid-60s, it was the second most industrialised state regarding value added and even surpassed the state of Bombay, i.e. Maharashtra and Gujarat combined, relating to the number of factories and employment. However, by the turn of the century, West Bengal lost its past standing and its share to all-India net value added, the share of factories and employment came down drastically - thanks to the rule of the Communists. A dictatorship of the bourgeois, led by a coterie with Jyoti Basu at its helm, ensured mass killing of dissent, purging of ideological disparities, complete lack of industrialisation, economic disintegration and burgeoning unemployment. In the case of the manufacturing sector, the state's share in NSDP went down from 25 per cent in 1960-61 to 10 per cent in 1999-2000. From 1971 to 2002, the state's share of net value added in factory sector fell from more than 14.38 per cent to 4.16 per cent and its share in employment from 16.19 per cent to 6.99 per cent. In 1980-81, Bengal occupied the fifth position regarding in per capita income after Gujarat, Haryana, Maharashtra, and Punjab. By 2000-01, the state slipped to the tenth position. States like Tamil Nadu, Karnataka, Kerala, Andhra and Himachal Pradesh developed fast, and West Bengal was simply not able to cope with the pace of development. The last years of communist rule under Buddhadev Bhattacharya were ironically quite different from the iron curtain years of his predecessor. Inheriting a communist apparatchik marked by labor unrest, non-development, lack of any investment and widespread unemployment he tried to lure his comrades toward a more developmental outlook. 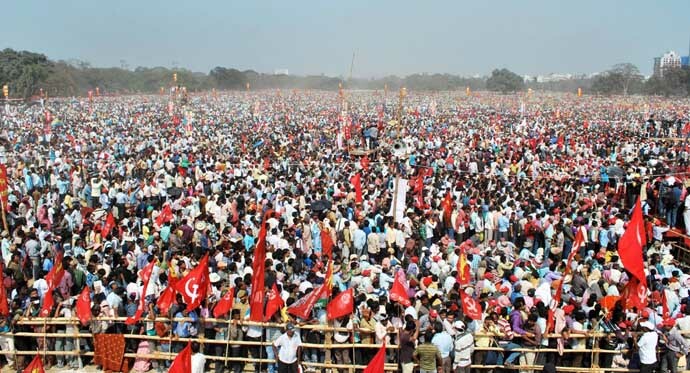 A Left Front rally in Kolkata's famous Brigade Ground. The state government had invited Tata Motors to set up a plant at Singur, and Indonesia-based Salim Group to set up a chemical hub at Nandigram, for which, farm land was forcibly acquired using the colonial Land Acquisition Act 1894. The lumpen proletariat, who meanwhile garnered considerable power in Jyoti Babu's style of communist dictatorship felt un-nerved by this change and decided to change loyalties giving rise to TMC. The massive unrest that ensued due to proletarian protests were mercilessly subdued leading to the massacre of the general populace in thousands reminiscent of the communist regimes of Stalin and Mao ZeDong from whom Indian communist draw inspiration. The people of Bengal were less agreeable to give Mr Bhattacharya another chance despite the fact that they put up with the non-functioning Jyoti Basu's Stalinist regime for over 30 years. The communist who dominated the Bengali social and political space for a very long time were successful in many different areas. They ensured that an army of thugs manning CPM at the ground level decided at every point where the money would be flowing and accordingly demand cuts on every investment. It made Bengal alienate all investors. Even daily traders had to register their business to the local CPM "syndicates" to ensure "protection" of both their life and property. Those few who still had the spine to stand against this were efficaciously forced to leave the state or were maimed or exterminated to submission. Thus, the local syndicates decided on whom to award contracts to build flyovers based on cutbacks paid, rather than over who is more competent and has experience. The TMC was a change of regimen on paper but is structurally similar to the lumpen elements that manned CPM syndicates. As these goons who owed their legacy and ideology to mass murderers in communist Russia and China soon had themselves change colours overnight and do the same for the TMC. Thus, though there was a change in leadership at the highest level, the apparatchik has essentially remained the same. 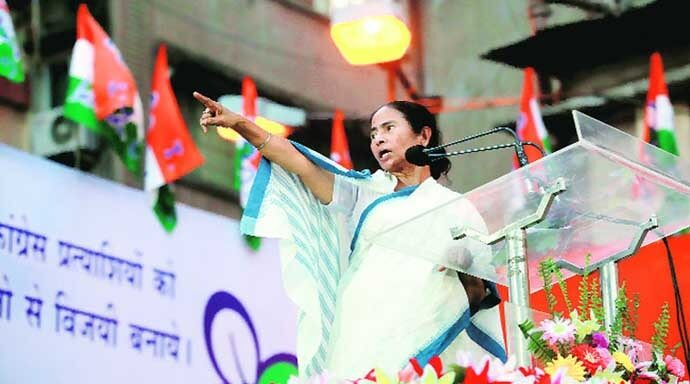 Mamata Banerjee addressing a Trinamool Congress rally. Even after a change in government in 2011, there was no change on the industrial front. Regarding project implementation, according to West Bengal Economic Review 2012-13, there was a fall of about 85 per cent compared to the previous year and 97 per cent compared to 2010, the last year of communist government. By 2013, since there was no budgetary push to boost Bengal's industrial sector, big industries started losing faith. One of the substantial barriers to industrialisation in the state has been a scarcity of land, which is primarily due to the Urban Land Ceiling and Regulation Act 1976, which the TMC government has refused to repeal. Even to this day, the state's land acquisition policy continues to be a stumbling block for projects that need large tracts of land. Moreover, carrying on with the communist legacy, labour unrests continued to plague the state, which recorded the highest number of lockouts. In 2014, the state's flagship project, Haldia Petrochemicals and India's oldest car maker, Hindustan Motors were forced to shut down. Jute sector, the state's second highest employment generating industry, also suffered heavy losses and about 100,000 workers lost their jobs due to labour unrests and lockouts. The political scene in Bengal, unfortunately, looks very dismal. The almost equal power of the communist and TMC has one advantage; at least theoretically, they could bring in a competitive agenda of development to a state languid with years of anarchy and bankruptcy. That is only if only they are willing to mend their ways under checks by political opponents if there is a close election result. This election has BJP as a new player in the scenario of Bengal politics. The party is yet to show it cares for Bengal by promoting intellectuals and filling its ranks with pure breed rather than weathered lumpen elements who wore red (CPI-M) and green (TMC) uniform in the past and facilely change into orange by the appearance of dawn. It is indeed strange that while the RSS draws its inspiration from Swami Vivekananda its protégé, the BJP does not seem to be overtly interested in protecting one of the main bastions of so-called "Hindu intellectualism" if I may use the word.While the world looks at Bengal for intellectual inputs on yoga and meditation and for changing this planet to a more positive paradigm, the people of Bengal continue to languish under different corrupt regimes. Aniruddh Rakshit contributed to the research for this article.